The False Claims Act (“FCA” or “the Act”) is a powerful tool that allows private citizens to play a key role in fighting fraud on the federal government. As we have reported in previous blog posts, this term the Supreme Court agreed to look at a disagreement among appellate courts regarding the issue known as implied certification. Our whistleblowers’ law firm is pleased to report that the Court recently released a decision that affirms and strengthens the Act, ensuring it is available to fight a wide range of fraudulent acts. As explained in The False Claims Act: A Primer, a guide released by the Department of Justice (“DOJ”), a person violates the FCA when they knowingly submit a false claim for payment to the government, knowingly cause another to submit a false claim, or knowingly create a false record/statement in order to induce the government to pay a false claim. The Act was originally passed during the Civil War. It underwent substantial revisions in the 1980s and again in 2009 and 2010. This year, the Supreme Court took up the case of Universal Health Services v. United States ex rel Escobar in order to resolve a disagreement among lower courts regarding the interpretation of the Act. In Escobar, the parents of a teen who died while in the care of a mental health clinic alleged that the staff was not properly supervised and that the clinic lacked properly board-certified/board-eligible supervisory personnel. Using a portion of the Act known as the qui tam provision, the plaintiffs claimed the clinic defrauded the government and violated the Act when it filed for Medicaid reimbursement. Acting on the government’s behalf, they sought repayment of these funds. The Escobar plaintiffs’ case relied on a concept known as the implied certification theory. They claimed that the clinic’s failures amounted to a violation even though the government did not expressly condition payment on adherence to the relevant regulations and the clinic did not expressly claim compliance when it requested reimbursement. Instead, the plaintiffs suggested that asking for payment while in violation of another regulation amounted to a false claim. 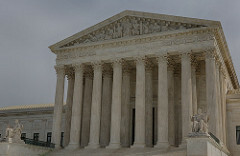 The Supreme Court took up the Escobar case because of a disagreement among appellate courts as to the validity of this implied certification theory. In so holding, the Court noted that liability can attach even if the requirements at issue were not express conditions for payment. The Court was clear that not just any regulatory, statutory, or contractual violation could be used as the basis for an implied certification claim. Instead, the violation must be both knowing and material. Under the Court’s framework, it is not sufficient to say that the government would have been entitled to refuse payment if it knew about the violation. Instead, the Court holds that materiality is a rigorous and exacting standard, reaffirming that the FCA is not simply “an all-purpose antifraud statute…or a vehicle for punishing garden-variety breaches of contract or regulatory violations” (internal citation removed). We applaud the Supreme Court’s decision in Escobar. It adheres to the clear language of the Act and it ensures that Congress’s purpose in enacting (and revising) the FCA is carried out. The decision allows the Act to be effective and guarantees that liability does not turn solely on whether a contract specifically states that violating another existing regulation makes a request for payment improper. Under Escobar, government contractors, including health care providers, can be held liable when they knowingly attempt to request payment while in violation of important regulations. At the same time, the decision reaffirms that FCA liability is a serious matter and that the statute is not intended to create huge penalties for minor, unimportant violations.